After announcing the rodeo in Greeley for 30 years, Hadley Barrett has become synonymous with the Stampede. The Nebraska native, who now lives outside of Kersey, Colo., is an icon of the sport. 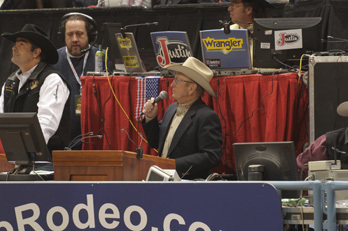 The four time PRCA “Announcer of the Year” has been inducted into multiple cowboy halls of fame – including the Pro Rodeo Hall of Fame (1999), the National Cowboy and Western Heritage Museum and Hall of Fame (2008), and the Cheyenne Frontier Days Hall of Fame (2009). Both men share a love of the sport with a focus on the business side of it. They know the event competes with other attractions for attendance and revenue and understand that the entertainment value provided by the rodeo is as important to the fans as a fast run or winning ride is to the contestants. The value Hadley and Will provide stems, in part, from skills polished outside the rodeo arena. Before becoming a full-time announcer Rasmussen gained popularity as a disc jockey in his home state. Barrett gained notoriety in the Midwest as a country singer and musician before dedicating himself to the sport. In fact, his musical career spanned more than 30 years and was punctuated by the induction of his band, known as Hadley Barrett and the Westerners, into the Nebraska Country Music Hall of Fame. Rodeo is a family sport (Barrett’s son Trent qualified for the rodeo’s finals in team roping) and both Will and Hadley are dedicated family men. While at home, Will spends time with his wife, Gabrielle, and follows the sports and school related activities of his five children. According to him, “My family members are my biggest fans. I certainly could not do this without them.” Hadley also spends his time off trying to keep up with his family which is made up of six children and wife, Lee. “She’s been a great rodeo partner,” comments Barrett. Be sure to make plans to attend next year’s Greeley Stampede. Will and Hadley will make sure you love every minute of it.